(English) Armenia at a Turning Point: What Role for the Parliament in the New Parliamentary Republic? 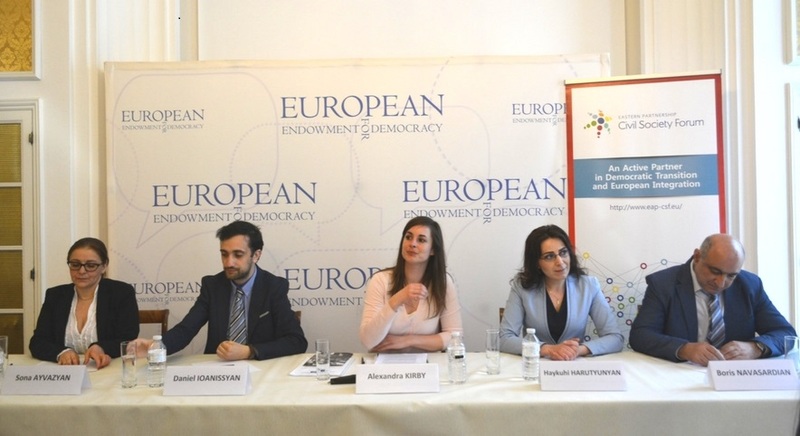 The discussion brought together civil society experts and institutional partners that exchanged their opinions on the parliamentary elections in Armenia that took place on 2 April 2017, the first in the country after its shift to a parliamentary republic. As Alexandra Kirby from EED pointed out in her opening speech, the recent elections prompted an unprecedented support from the EU, allowing for a more transparent process and overall satisfactory results. On the other side, however, the electoral process shed light on the significant challenges that the Armenian society is still facing and that the speakers sought to highlight in their interventions. Daniel Ioanissyan, Program Coordinator at the Union of Informed Citizens, provided some background on the pre-electoral environment, explaining how important it is for Armenian government to conduct elections without major protests, at the same time maintaining the international support that the country needs on major issues like the Nagorno-Karabakh conflict. While public support for the ruling party remains unprecedentedly low, new covert ways of manipulating the electoral system have been recently developed. Under the new mixed system, the cast votes are allocated towards parties not candidates, a procedure that the majority of the electorate had not been properly informed about. The voting day was marked by a similar atmosphere, as Sona Ayvazyan, Executive Director of the Transparency International Anti-Corruption Centre in Armenia, pointed out. She described the violations of electoral procedures, inter alia the presence of unauthorized people at the polling stations, interference with and frequent intimidation of observers. Moreover, Ms Ayvazyan reminded the audience that the recent constitutional change received the approval of the Council of Europe Venice Commission. Therefore, in order to counter the influence of the ruling party the civil society has to work on improvements in civic education and job security system. Haykuhi Harutyunyan, Protection of Rights Without Borders NGO and EaP CSF Steering Committee member continued in the same vein, citing a great number of violations related to vote buying and bribery. She highlighted that many of them were not addressed in an appropriate manner or completely overlooked by the authorities. According to Ms Harutyunyan, they also refused to prosecute the majority of wrongdoers or take concrete actions in order to prevent this from happening again in the future. In this light, the absence of a whistle-blowers legislation poses a significant challenge for a proper implementation of complaint and appeal procedure. Boris Navasardian, member of the EaP CSF Steering Committee and President of the Yerevan Press Club, which closely monitored the elections described that while there was a change in Armenian political culture, no real improvement can be observed. Among the media restrictions, he mentioned the digital switchover of the country, which resulted in an even less diversified broadcasting landscape and heavily affected the elections’ results. “On 18 May the new Armenian parliament meets for the first time. However, its only function was to secure the majority of the ruling party. The paradox is that the switch to parliamentary republic means the Parliament will have a very limited role within the political system”, commented Mr Navasardian on the challenges ahead and need to closely monitor the situation. MEP Heidi Hautala, Head of the EP delegation to the Armenian elections, stressed the importance of the Comprehensive, Enhanced Partnership Agreement (CEPA) to be signed between the EU and Armenia in November 2017, and the need to present clear demands to the partner country, while the agreement will upgrade the relationship between the two parties to a new level.